"I can read the inmost secrets of your heart." Image has released another gorgeous silent film restoration in The Bells. Based on a play by Alexandre Chatrian and Emile Erckmann, The Bells is supposedly inspired by the Poe poem of the same title, but bears about as much resemblance to Poe as the 1935 The Raven. This seldom-seen film features Boris Karloff in an early pre-Frankenstein horror-type role, opposite the legendary Lionel Barrymore (best known today for It's a Wonderful Life). Barrymore plays Mathias, a debt-ridden innkeeper with aspirations to being burgomaster of his unnamed town below Mt. Snowtop. When his grasping neighbor seeks to collect the debt, Mathias turns to crime, murdering and robbing a wealthy Polish Jew that happens to stop by his inn. Mathias pays off his debt and earns his position of esteem, but is slowly driven mad by the apparition of his victim, who menacingly shakes his sleigh bells at Mathis. The victim's brother, Jethro (E. Alyn Warren in a double role as both the victim and the brother) seeks to have Karloff, as the unnamed mesmerist, attempt to cause the guilty party to confess. Karloff is appropriately menacing, giving Mathias an unforgettable death's head grin as he departs upon being sent away by the burgomaster. Barrymore gives a solid performance throughout, though he seems to take to homicide rather readily; it would have been better to see him more desperate before he takes an axe to the merchant. Technically, the film is a tour de force. The photography has a wonderful depth of focus throughout (except in the concluding dream sequence, which is intentionally very soft). The special effects are convincing, most notably in the sequence where the thoroughly mad Mathias plays a game of cards with the spectre of the Jew. Barrymore expertly plays against the empty space before him, believably conveying his ability to see the spirit across the table. Karloff's costume is very heavily patterned on that of the mesmerist in Cabinet of Dr. Caligari; he appears nearly identical down to the cloak, top hat, frizzy gray hair and tortoise-shell glasses. The only aspect he's missing is the three-striped Mickey Mouse gloves. During the concluding dream, the German Expressionist qualities of the earlier film are allowed free rein, with mysterious shafts of light piercing the darkness at crazy angles. 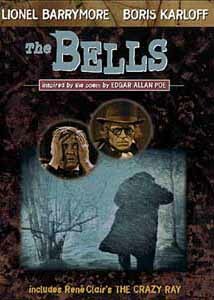 The original titles appear to be retained (with the image of the ghostly bells sometimes appearing in the background). The film is run at the proper speed so that the action moves normally. The film is from the Blackhawk Films collection, and the restoration is copyrighted by Film Preservation Associates. Image Transfer Review: Image presents The Bells from an original tinted silver nitrate print. The picture is quite lovely indeed. There is faint speckling throughout the movie, but not enough to be distracting. There are a few jumps where a few frames have been lost (unfortunately, several of them from Karloff's introduction as The Mesmerist—perhaps souvenirs taken by projectionists? ), and a couple instances of visible frame damage, but overall this print is just gorgeous. The tinting is mostly sepia, although there are a few scenes tinted blue and green. One of the blue nighttime scenes, where Mathias tears down a poster offering a reward for the killer, is transferred rather too dark and is difficult to make out. Bit rates are high, ranging around 7 to 8 Mbps. Overall, this is one of the better-looking silent films I've seen. Considering its rather minor status, I expect that this is the best it will ever look. The companion piece, The Crazy Ray (1922), by contrast is very scratched and rather beaten looking. The quality of the two is worlds apart. Audio Transfer Review: The audio is newly recorded orchestral musical score. The score seems to be primarily a compilation of classical music from various sources; I recognized part of Wagner's Das Rheingold, among other. The mono track does an adequate job of conveying the score, though a stereo track would have been nice. The sleigh bell sounds come through clearly and crisply, although they are not always quite synchronized to the screen. Obviously, if the theatrical organist had sleigh bells to ring, he would not be quite synchronized either, so this is hardly a serious failing. They are startling in their clarity, so clearly some attention was given to this point. Extras Review: The only extra is the American version of Rene Clair's The Crazy Ray (retitled here At 3:25). This 18 minute and 22 second two-reeler tells a slightly loopy science fiction story of a mad scientist who creates a ray that causes all of Paris to become stuck in time. The only people who escape this paralysis are a group of seven who were in an airplane over the city, and the night watchman for the third floor of the Eiffel Tower, since they were all above the effects of the ray. The first three-quarters of the film depict the elation of these eight, who have free run of the city. The elation soon turns to frustration and depression, until they receive a cry for help over the wireless. As noted above, the source print is less than good. The frames are scratched and scuffed throughout, making it rather difficult to watch, especially after the beautiful print of The Bells. The short is nonetheless a charming little piece and it counterpoints the rather grim circumstances of the main feature rather nicely. Oddly enough, Clair is not credited on the film anywhere; only the editor (presumably the U.S. editor) Morrie Ryskind received any credit of any kind. I don't know whether there are any significant portions of this film missing, since this is the only print of it I've seen. This short film is a nice extra, but there is nothing at all in support of the main feature. A beautiful print of the main feature, one of the early horror films, makes this a must for fans of silent pictures and of Karloff. Overall an enjoyable, if brief, feature.